Be Brave, Be Bold — 46 South Fish Co. There are a lot of seafood restaurants around, especially in Vancouver. However, it seems like many of these restaurants are sticking to the basic and safe strategy of salmon, halibut and sablefish. There is so much more out there and it is a shame restaurants and restaurateurs aren't more excited about the strange and exotic fish that is now available. There are, however, some courageous chefs that are experimenting with various fish and spicing up the Vancouver seafood scene. Think back to the last number of times you saw seafood on a menu. Was it all the same? If not, that's great! We'd love to know about those restaurants, or if you're a chef reading this then please drop us a line. But, for those of you that saw the same baked salmon dish, seared tuna dish, and classic fish and chip dish.....you get our point! The variety of fish (shall we call 'seafruit'?) and ways to cook them are practically endless. So why do we see the same dish over and over? Now there's nothing wrong with a classic. What we are trying to get at is there is so much room for creativity in the seafood world. What happens is restaurants get set in a routine because they know what will sell - always go with a safe bet rather than taking risks. The restaurants are catering to our comfort level, always counting on us to order the same dish. So tonight, this week, or even this month, why not try something you've never had before? Encourage yourself to step outside the box. The more we encourage a chef's creativity, their art, the more beautiful and unique dishes we will see in the future. Who knows, maybe the best fish recipe hasn't even been invented yet and it just needs a little moral support from us! If you are in the Vancouver area, here are some suggestions. Some of our favourite restaurants right now include Supermarine, Savio Volpe, Bao-Bei Chinese Brasserie, Beach Bay Cafe, Espana and Farmer's Apprentice because of their diverse menu, which is constantly changing based on what's fresh, in season, and whatever the chef feels like cooking! 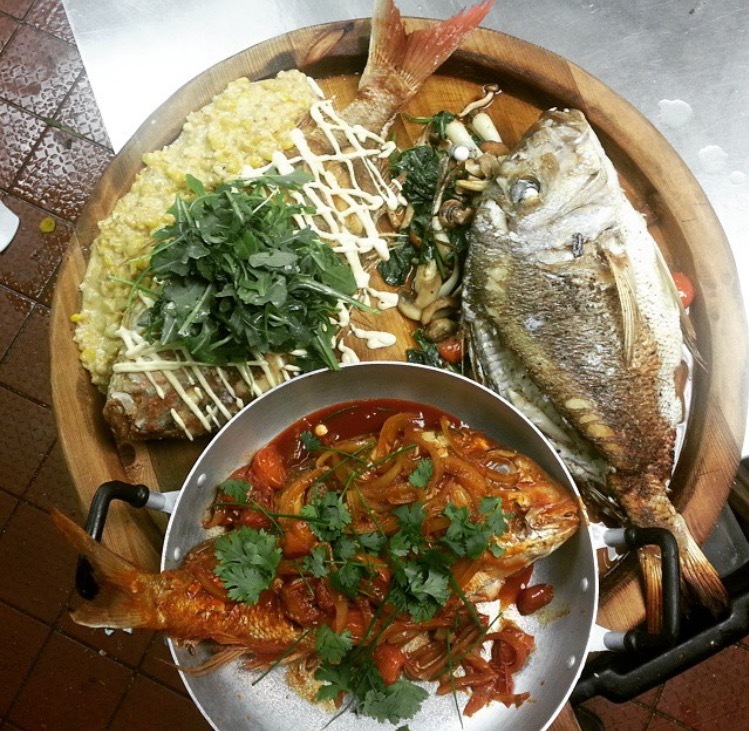 New Zealand Red Sea Bream done in three ways by Chef Rodrigo at Rodney's Oyster House Toronto.